Jeep has been trying their damndest to keep the all-new 2018 Wrangler under wraps until it is official debuted. Luckily, we've gotten plenty of hints at what's in store, and we now have a pretty good idea as to what to expect – especially from the latest spy photos. 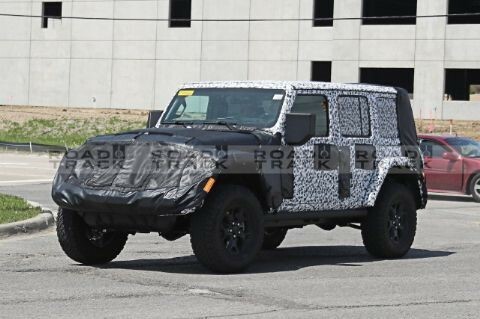 Like Wranglers before it, it seems from these photos that the 2018 model will have a shallow, largely vertical dashboard, which harkens back to the flat metal dashboard of the earliest military and civilian Jeeps. We especially noticed that the large central infotainment screen handles navigation, music and heated seats, while also displaying information on vehicle settings and climate control. We are unsure however, that the new vehicle will have a (somewhat) weatherproofed dashboard which allows owners to pull the drain plugs from the floor and hose out the interior like previous Wranglers. We're also interested to see whether Jeep will offer some kind of waterproofing to save the touchscreen from rain and mud splashes. 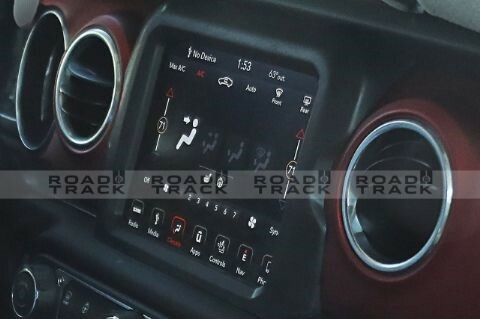 The familiar FCA controls for heat and air conditioning can be found below the new infotainment screen as what looks like a dual-zone automatic climate control system. This may indicate that the vehicle is a higher trim-level. Below that are the four centrally-mounted power window switches, like the current JK-generation Wrangler. This almost definitely means that the next-generation "JL" Wrangler will keep its removable doors. We also manage to see what looks like a stick shift with a leather boot, possibly flanked on the driver's side by a manual shift lever for the 4x4 transfer case. The photos also seem to indicate that the Wrangler's dashboard will be painted either to match or contrast with its exterior, but perhaps the colour-keyed dashboard will be a feature of the higher-end Wrangler.